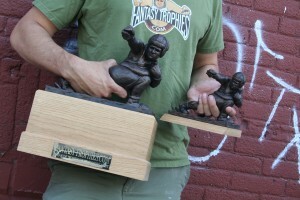 Yesterday was a big day at FantasyTrophies.com. I finally completed the fantasy football trophy that has been about 5 years in the making. Ever since I started sculpting the large Throwback I always knew that a smaller version would be soon to follow. I had no idea though that it would’ve taken this long to finally introduce it. Well, he’s arrived. Introducing the NEW Mini Throwback. Contact me for details. We’re in the process of putting it up on the site and he’ll definitely be ready for your draft. Previous post: Handmade fantasy football trophy -video.